The Arbor Roundhouse use to be called the Arbor Roundhouse RX but for 2014 they eliminated the camber model (Roundhouse CX) so the name returns to just the Roundhouse. This is the mid/wide to wide version of the Arbor Element. It should just be called the Element Wide. The 2014 and 2015 Arbor Roundhouse is made at a new factory because the old factory (Elan) went under. 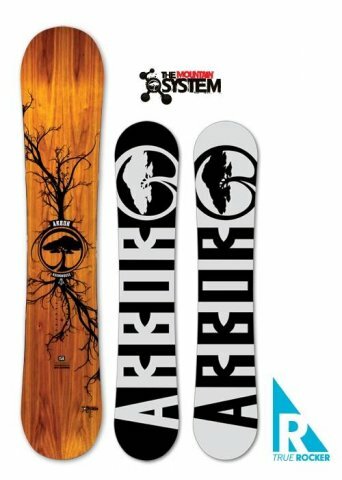 The new factory (SWS) is filled with all the people that made Arbor boards so the 2014 and 2015 model came out with the same quality ride as the 2013 and have a very similar ride except the new nose and tail give you a little more float in powder. The Arbor Roundhouse is a good continuous rocker directional twin for taking a freestyle approach to powder riding or hitting the mountain with a switch/regular approach. The only real issue here is it lacks a satisfying feeling when it comes to hard to carving turns. On Snow Feel: The Arbor Roundhouse RX has a somewhat loose playful feel between the feet and offers a good ride for those who like a catch-free all mountain freestyle approach to the mountain. The 2014 has less of an effective edge but the ride is still very much the same. Most continuous rocker boards are loose but this is semi stable and feels like a lot of hybrid rocker boards we have tried. One footing and flat basing is not going to be ideal and we found it want to spin on us when flat basing. On long flat cat tracks, you will miss the stability hybrid shapes offer. Also when the snow is hard the board get’s pretty loose and even more spinny. It’s best to always be on edge. 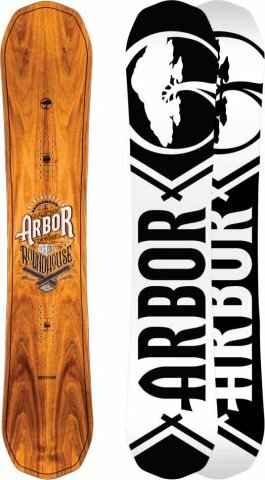 Powder: We’d love to see a setback stance with the Arbor Roundhouse for powder but this continuous rocker board still floats really well. 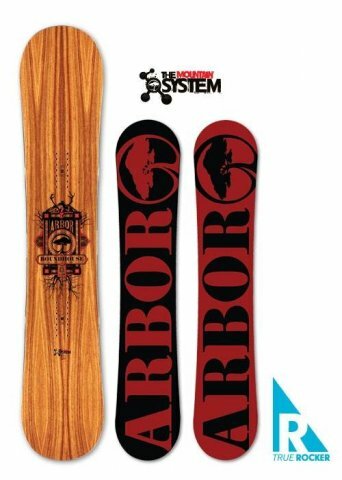 This is ideal for that rider who likes to ride switch in pow as much as they ride regular. It’s very easy to maneuver in tight chutes or through trees. The reduction of the effective edge and the extension of the nose in the 2014 model makes the lot a lot easier and it’s really good for a twin. The Roundhouse does have 7 inserts instead of 6 so it can be set back a bit for a twin with a centered stance. It’s no set back directional twin but it’s better than most centered directional twins when it comes to setting it back. Turn Initiation and Carving: Nice and quick edge to edge…well if you have big feet. Short quick turns are the most fun with the Roundhouse. As turns get wider and move into the realm of carving the board kind of falls apart here. It’s doable but just not as fun as railing a turn with a board with some camber in it. You have to keep the pressure between the feet and on the grip tech inserts. Also there is no resistance into or spring out of the carve. Instead, it just hurries you into and out of it. Speed: Nothing out of control and the Arbor Roundhouse RX can get a little unstable when you pick up speed. It’s better than the Wasteland and almost the same as the Westmark. Uneven Terrain: The Arbor Roundhouse is not as effortless and bouncy through rough terrain as the Wasteland but you get a little more speed in return for almost as good as a feel underfoot heading over bumpy terrain and dealing with the end of the day conditions. Approximate Weight: Felt pretty light but not super light. Just normal. 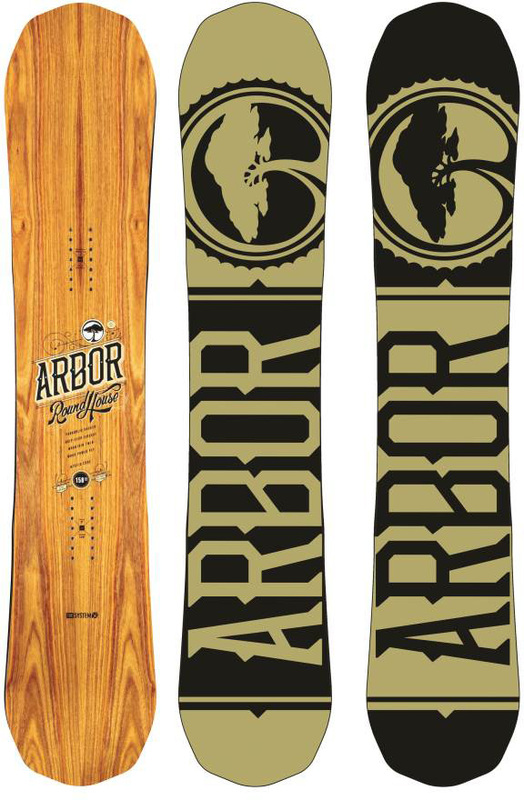 Edge Hold: Arbor’s Grip Tech is just right for most that ride in everything but icy snow which applies to most riders. Yeah, it can hang in icy snow for sure but there are boards that grip better here. Flex: Very easy to butter and play around the mountain. Even though this has a medium flex anyone can butter with this. Jibbing: You know it can be done with this board but I’d much rather be on the Draft orWestmarkk if I’m going to lap the jib park all day. Pipe: Edge hold is sufficient and it’s very forgiving but I actually prefer more stability between the feet in icy pipe walls. Jumps: Lot’s of pop here between the feet. Continuous rocker requires you to land centered but if you land more on the tail by accident it can wash out and punish you. Stil,l this is a very fun board to get air with. So all in all we all love the pop, float in powder and playfulness of the Roundhouse. We just wish it had a little more stability and was a little more fun to carve. If you can get past those 2 issues then this is a really fun board. We try to get as many images of the Arbor Roundhouse, but forgive us if they're not all there. Love the rocker, still loose but stable. I was sceptical about the grip-tech but can honestly say it does work. It's playful when you want it to be but responds and holds when you need it to. Having big feet really limits your choices of boards. Compared to other boards I've had it does feel heavier but thats a small price to pay for quality construction. Having dodgy knees I thought after a full day of riding and sitting on chairs that the weight would cause some grief, but it didn't even hurt a bit. This board makes riding more relaxed and effortless, I rode first chair till 3:30pm one day and felt a million dollars at the end of the day. It felt easy to ride and required less effort to control. I was wanting a flexible board and this board wasn't the most flexible... so I was hesitant to purchase it but, I think the flex is pretty much exactly what I needed. Still yet to ride it through pow but hard packed groomers, chopped up crud, in and out of the trees, bits of the park was no trouble for this board. Can get a bit loose when travelling at high speed... but still fast enough to be going too fast! Not a big fan of the wood grain look but it's a small price to pay for having the right board. I have only spent 3 days on it but they were 3 awesome days and loved the way the board performed. I rate it slightly higher than 4 out of 5 (4.3). Still the best board I've owned and can't see myself riding any other for a while to come.